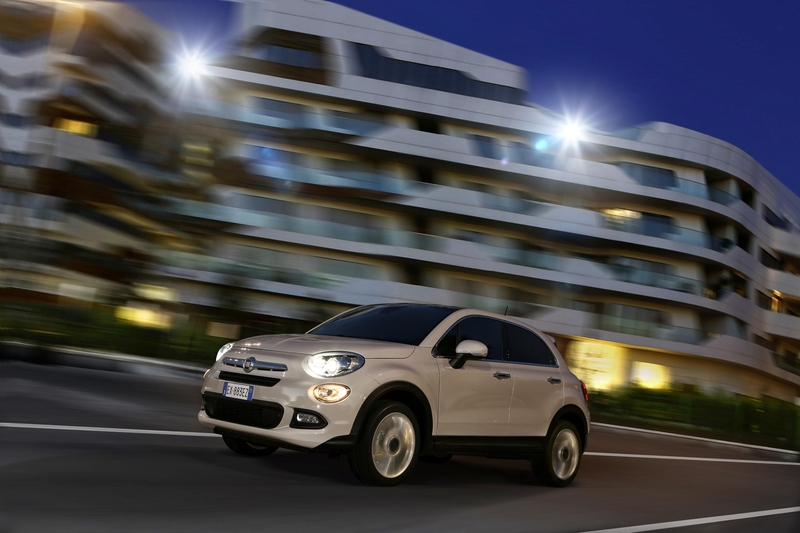 Following on from its world début at the Paris Motor Show, the FIAT 500X is presented to the UK media for the first time at the international launch in Turin and Balocco on November 13 and 14, 2014. The all-new 500X is a crossover not only in terms of vehicle segments, but also in terms of its potential customers. With two distinct flavours on offer, there is a 500X to suit every need and taste: One is designed to appeal to those with a fun-loving, spirited, metropolitan outlook available in Pop, Pop Star and Lounge trim levels, and another, more rugged version has been designed with stylish, active adventures in mind available in Cross and Cross Plus specifications. A choice of 12 different body colours and eight different designs for the 16-, 17- and 18-inch alloy wheels, will help every owner personalise the look of their FIAT 500X even further. Designed in the Centro Stile FIAT, the new 500X not only has clear links to its siblings in the current 500 family but also the iconic 1957 original, most notably its large, circular headlamps (albeit with a sportier, more aggressive shape than the 500 or 500L), its unmistakable nose brightwork and distinctive clamshell bonnet. 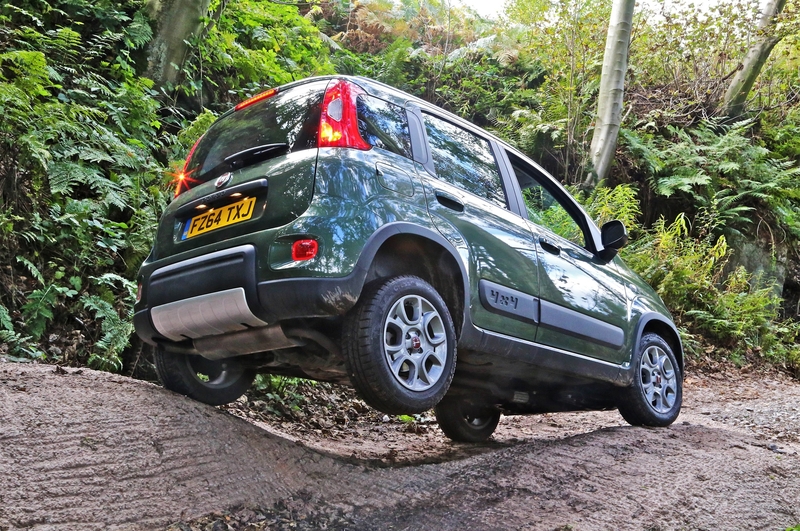 Compact on the outside, measuring 4.25m in length (the FIAT 500X Cross/Cross Plus is 2cm longer), 1.80m in width and 1.60m in height (1.61 with roof bars, 1.62 with 4WD) with a slippery drag co-efficient of 0.34 CX, the FIAT 500X is also spacious, flexible and inviting on the inside, with extensive use of high-grade materials, top-quality finishes and practical storage compartments, including a spacious 350-litre luggage compartment which can be extended to accommodate all manner of loads using the Fold&Tumble rear seats and the fold-flat front passenger seat. A removable load platform which is reversible and height adjustable is also available. The new front seats offer a high degree of comfort and adjustability with wraparound bolstering and perfectly aligned arm rests in the centre console and door trims to aid relaxed cruising. With a “H point” of 669mm (distance from the ground to the driver’s hip) the FIAT 500X offers excellent visibility while also ensuring the passengers feel safely enclosed and connected with the vehicle. Drivers of all-wheel drive versions sit 697mm from the ground, mainly due to the revised suspension settings and different wheels and tyres. 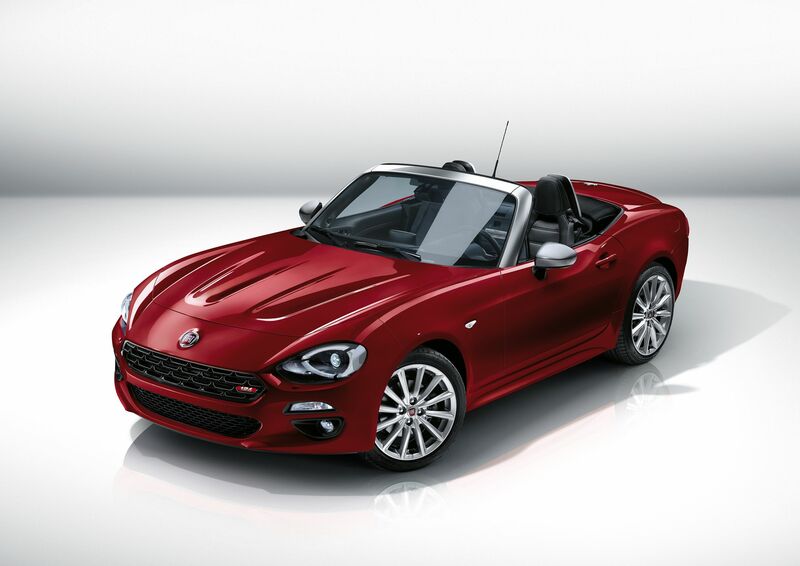 A choice of seven fabric, leather and colour configurations is available, depending on the model and exterior colour, and amongst the premium options offered in the 500X, a full-length “Sky Dome” glass sunroof is available to bathe the cabin in natural light. For the driver, there’s a new instrument binnacle divided into three, circular, individually cowled displays, with the large, central display featuring a reconfigurable 3.5-inch TFT display, flanked by speedometer and rev-counter in the other displays. A new steering wheel offers improved grip and comfort as well as new audio and vehicle system controls and while the dashboard panel retains the retro look of the 500, new switchgear and 5.0-inch or 6.5 touchscreen Uconnect™ systems set the 500X apart as an all-new model. Both Uconnect™ units (not available on Pop) feature Bluetooth phone and music streaming connectivity, as well aux-in and USB ports, and the system can even read incoming text messages on compatible mobile phones, allowing the driver to respond using a number of pre-programmed responses. The five-inch Uconnect™ unit is operated via the touch screen, steering wheel remote controls and voice commands and can be upgraded to include DAB digital broadcasting and TomTom 2.5D navigation with voice commands, real-time traffic updates and re-routing and guidance prompts in the instrument cluster display. Safety cameras alerts, TomTom “Search&Go” local search service and real time weather forecasts are also available. The 6.5-inch system features satellite navigation with 3D maps, progressive route guidance and ‘One Shot Voice Destination Entry’ to enter addresses easily and quickly with voice commands. The FIAT 500X is also the latest model to offer a BeatsAudio™ sound system, developed in collaboration with Beats by Dr. Dre. The premium hi-fi system boasts a 560W, eight-channel digital amplifier which integrates an advanced equalisation algorithm designed to recreate the entire sound spectrum that an artist experiences during their studio recordings. Standard FIAT 500X audio units feature either a 120W four-speaker system or a 180W six-speaker configuration, depending on the model. The BeatsAudio™ system, however, features two dome tweeters in the dashboard, two 165mm mid-range speakers in the front doors, two dome tweeters in the rear doors, two 165mm mid-range speakers in the rear quarter panels and a 20mm, 15-litre subwoofer integrated into the luggage compartment. The new UConnect™ Live system also allows customers – through integration with their smartphones – to use many apps on the on-board system so that they can always be in contact with their friends on Facebook and Twitter or listen to millions of music tracks on Deezer or more than 100,000 radio stations with TuneIn. They can also get real-time news updates from Reuters and get the latest traffic, safety camera and weather information from the TomTom Live service. Customers need only download the Uconnect™ LIVE application from the Apple Store or Google Play Store to display and control the applications which have been specially designed and adapted for use when driving. Uconnect™ LIVE also facilitates the my:Car service (UK availability TBC), which offers real time alerts, servicing reminders and an interactive owner handbook to help drivers manage vehicle maintenance. When a smartphone is connected via Bluetooth, the most important alerts are automatically forwarded to the owner’s personal Uconnect™ LIVE account, making managing maintenance easier than ever before. 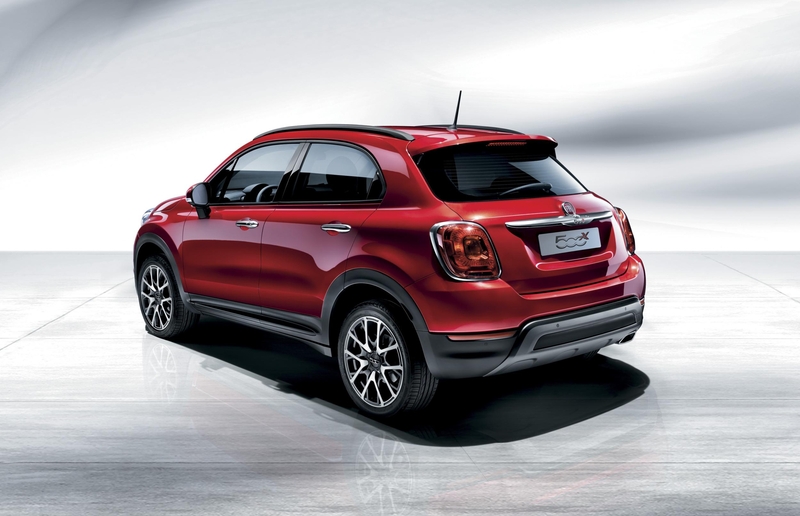 Even the FIAT 500X’s eco:Drive system has evolved, replacing the USB-based system with a mobile app which is connected via the cloud for automatic driving data transfer, while Uconnect™ LIVE services can also be updated via a compatible smartphone. To complete the premium Italian ambience of the new FIAT 500X, the interior benefits from the extensive use of sound-absorbent materials, from the soft-touch dashboard materials to the PVB layer inside the windscreen which improves the articulation index, and the segment-exclusive acoustic deflectors on the pillars created entirely from absorbent foams. To demonstrate the designers’ attention to detail, even the floor mats in the 500X are unique and exclusive: they feature a print of a map of the Melfi factory as a means of expressing the pride taken by the Italian manufacturers in creating this high-quality product. In keeping with its philosophy of appealing to every spectrum of customer, the FIAT 500X will be available with a broad range of powertrain options in the UK. 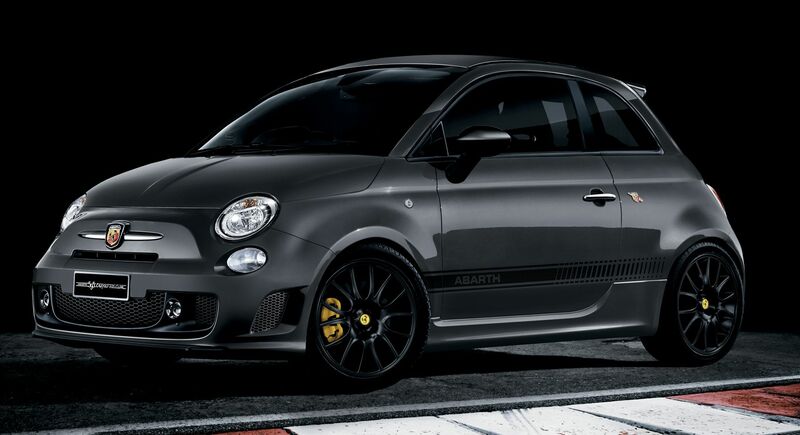 Front-wheel drive, petrol-powered models are either equipped with a 110hp, 1.6-litre “E-torQ” engine with a five-speed manual gearbox or a 140hp 1.4-litre Turbo MultiAir II petrol engine with either a new-generation six-speed manual gearbox or FIAT Powertrain’s renowned six-speed twin-clutch transmission. The all-wheel drive petrol model, which is equipped with a first-in-class, nine-speed automatic transmission as standard, is powered by a 170hp, 1.4-litre Turbo MultiAir II engine. The front-wheel drive diesel range consists of the 95hp, 1.3-litre MultiJet II turbo diesel, equipped with a five-speed manual gearbox, and the 120hp 1.6-litre MultiJet II turbo diesel equipped with a six-speed manual gearbox. The four-wheel drive diesel option is the 140hp 2.0-litre MultiJet II turbo diesel, which will be available with a six-speed manual or nine-speed automatic transmission. The new nine-speed automatic transmission is a first not only for FIAT but also for the crossover segment in which the 500X competes. This new, electronically-controlled, nine-speed automatic transmission features advanced shift management to combine optimum driving pleasure with efficiency, while also offering the possibility of switching to manual-sequential mode. 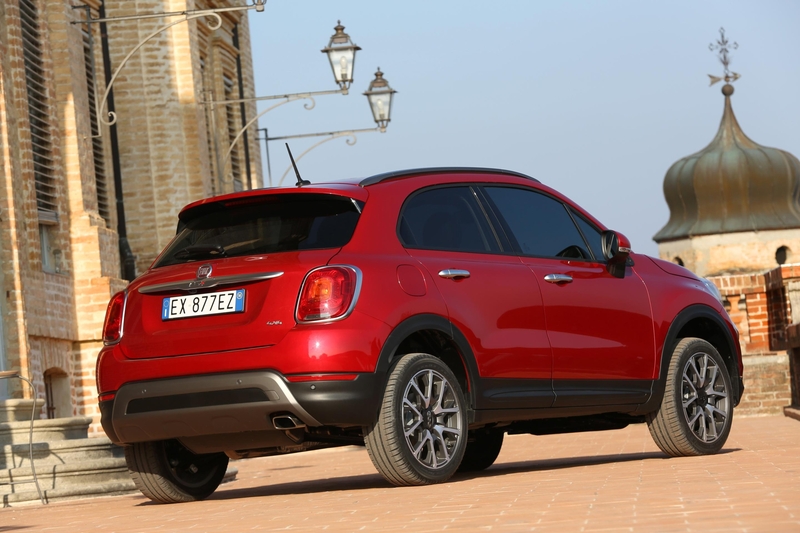 The FIAT 500X’s four-wheel drive system it drives adopts a fuel-saving rear axle disconnection system that seamlessly switches between two- and four-wheel drive for full-time torque management without requiring input from the driver. The result is a highly efficient drivetrain that offers excellent pick-up and smooth delivery of power, with sure-footed and dependable handling in all conditions. Ground clearance for all-wheel drive versions increases to 179mm compared to 162mm for front-wheel drive models, and its approach, departure and breakover angles are 21.3°, 30.1° and 22.3° respectively. It is also equipped with specific bumpers and protective skid plates to protect the bodywork and mechanicals from the rigours of off-road use. In terms of the rigidity of the FIAT 500X, around 70 percent of the total structure is comprised of high-strength steel and structural adhesives which serve to reduce the overall vehicle weight, to improve longevity and to maximise strength in the case of collision. Equipped with an independent MacPherson suspension front and rear, the FIAT 500X has been engineered to strike the optimal balance of handling and comfort that the segment demands. On the front axle, the FIAT 500X features a special dual-function cross-member which offers high rigidity for greater acoustic comfort and an integrated third load line to improve energy absorption in the event of a collision. A “split” type of shock absorber mounting is also employed, to dissipate vibrations from the road to the body structure through two different pathways, improving acoustics and shock absorption efficiency. In addition, the latest active safety systems are available to improve handling and assist the driver, including sophisticated ESC (Electronic Stability Control) and DST (Dynamic Steering Torque) systems, which improve both driving safety and handling performance by actively correcting over and understeer. DST is completely integrated into the vehicle’s ESC system and intervenes to correct potentially dangerous situations caused by excessive deflection angles or instability due to poor wheel grip. ESC with DST; ABS with EBD; ERM (electronic rollover mitigation); Hill Start Assist; ASR (traction control); MSR (gearshift engine torque management); electronic parking braking, TPMS (tyre pressure monitoring system); front fog lights with cornering illumination (excluding Pop); automatic windscreen demisting (excluding Pop) and six airbags are all standard as part of the FIAT 500X’s safety package. Advanced safety options include ACC (adaptive cruise control), Lane Assist (lane departure warning system); Blind Spot Assist (lane change assistance system); ParkView reversing camera and Rear Cross Path (reversing blind spot warning system) will also be available, as is a new “Brake Control” assisted braking system, which can intervene between speeds of 4mph and 120mph to apply emergency braking, thereby helping prevent, or mitigate the consequences of, a collision if the driver fails to respond to the audio, visual or brief deceleration alerts. The sensitivity of the system can be adjusted relative to the driver’s preferences or can be disengaged completely. Even the driving experience can be personalised and adapted, depending on how the new FIAT 500X is being driven and the prevailing driving conditions. The “Drive Mode” Selector (not available on Pop version) has three different modes for engine performance, power steering settings, ESC calibration and shift patterns for automatic transmissions: “Auto” offers the best compromise in terms of comfort, consumption and CO2 emissions while “Sport” reconfigures the FIAT 500X for better performance and more spirited handling. “All Weather” adjusts the vehicle settings for maximum safety even in low grip conditions. 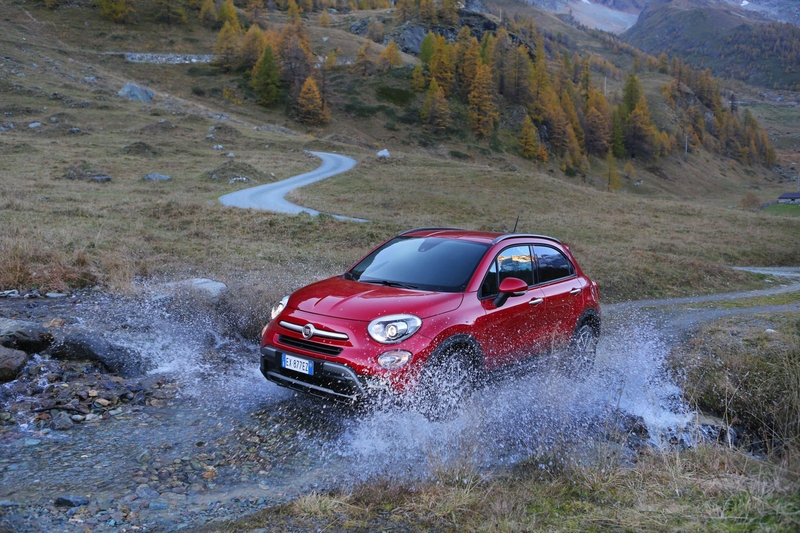 On the more rugged FIAT 500X Cross and Cross Plus versions, “All Weather” mode is replaced by the “Traction” function, which speeds up the transmission of torque to the rear axle on four-wheel drive versions or activates the “Traction Plus” electronic front differential system on front wheel drive versions, the latter offering an ideal solution to drivers who only encounter extreme low-traction situations occasionally, thereby avoiding the additional costs and slight emissions increase associated with a conventional four-wheel drive system. 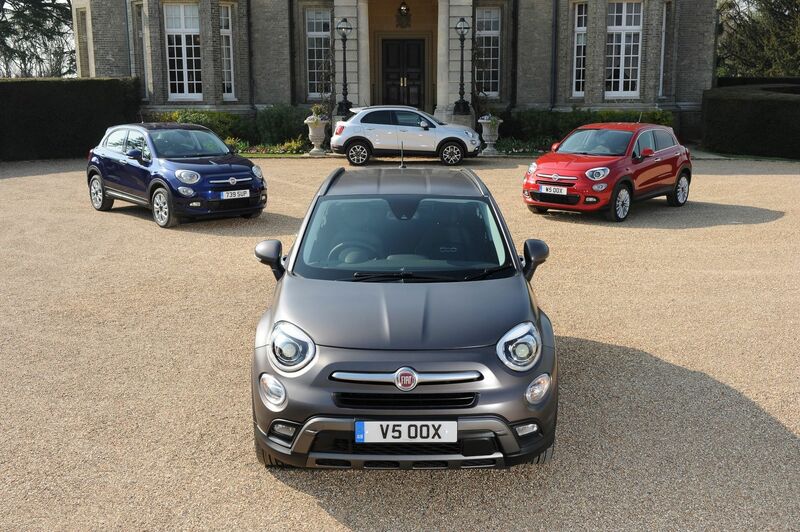 The UK FIAT 500X range starts with the Pop version which features 16″ wheels with gloss silver hubcaps, body-coloured bumpers; chrome-effect brightwork; cruise control with speed limiter; manual air conditioning; remote central locking with electric front and rear windows; a height-adjustable driver’s seat and a body-coloured dashboard panel. The Pop Star model adds 17-inch alloy wheels; body-coloured door mirrors; front fog lights with cornering illumination; automatic climate control; rear parking sensors; “Drive Mode” selector and the five-inch Uconnect™ infotainment system with Bluetooth, as well as broader range of engine choices including the 1.6 MultiJet II 120hp and 1.4 MultiAir II 140hp manual or DDCT. The Lounge version offers dark tinted rear windows; HID headlamps; an adjustable cargo floor; front floor mats; 18-inch alloy wheels; a chrome-effect exterior styling kit; a leather-trimmed gear shifter; the 6.5-inch Uconnect™ infotainment system with navigation; an adjustable front armrest with storage and ambient interior lighting. Compared to the Pop Star version, the FIAT 500X Cross includes the Traction Plus system; dark tinted rear windows; roof bars; unique bumpers front and rear with chrome exhaust trims; Cross-specific 17-inch alloy wheels; satin silver exterior detailing; a leather-trimmed gear shifter; a special dashboard finish and an adjustable front armrest with storage. The range-topping FIAT 500X Cross Plus builds on the high specification of the Cross but adds HID headlamps; an adjustable cargo floor; front floor mats; Cross Plus-specific 18-inch alloy wheels; the 6.5-inch Uconnect™ infotainment system with 3D navigation; the 3.5-inch TFT colour display and ambient interior lighting. 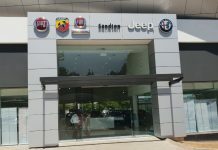 Built in the updated SATA plant in Melfi, Italy and sold in more than 100 countries worldwide including the United States, the new FIAT 500X will go on sale in the UK early in the second quarter of 2015. Pricing for the FIAT 500X will range from £14,595 OTR for the 1.6 E-torQ 110hp in Pop specification to £25,845 for the 2.0-litre MultiJet II 140hp AT AWD Cross Plus. 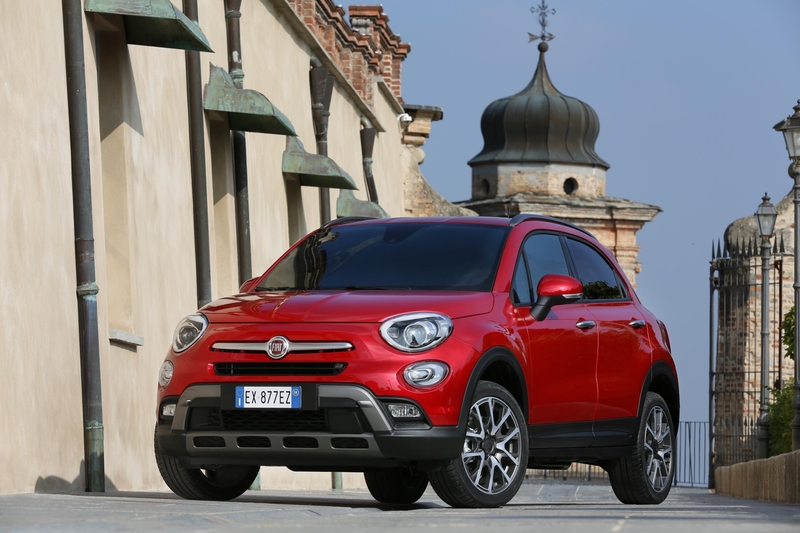 The first version of the FIAT 500X available to order in the UK will be the “Opening Edition”, offered with a choice of three powertrain options: 140hp 1.4 Turbo MultiAir II 4X2 manual, 120hp 1.6 MultiJet II 4X2 manual and 140hp 2.0 MultiJet II AWD nine-speed automatic. The 4X2 models are based on the urban versions of the FIAT 500X and only will be available with an “Art Grey” pastel paint finish. Standard equipment will include a range of normally optional features at no extra cost to the customer, including 18-inch alloy wheels; automatic climate control; Safety Pack (Lane Assist; Blind Spot Assist; ParkView reversing camera and “Brake Control” anti-collision system; Comfort Pack (Keyless Entry & Keyless Go; front armrest and electric lumbar adjustment on the front seats); tinted rear windows and exclusive “Opening Edition” badge. The AWD version is offered only in tri-coat “Amore Red” and, like the 4X2 version, includes a range of additional equipment at no additional cost, including the Uconnect™ 6.5-inch satellite navigation system; two-tone red-and-black leather interiors; Visibility Pack (rain and light sensors, power folding door mirrors, electro-chromic rear view mirror), steering wheel paddle shifters and exclusive Opening Edition badge. Depending on the version, this can be worth up to £2,850 of additional content at no extra charge for the first FIAT 500X customers. Pricing for the FIAT 500X Opening Edition starts at £17,595 for the 1.4 MultiAir II 4X2 with order books due to open in December.